UBC has increased its enrolment numbers consistently for years, but now wants to stop growth to address space and resource limitations. Over the past few years, domestic intake for undergraduate students at UBC Vancouver — which has to consider the provincial government’s mandate — has been stable. But the growth of new international undergraduate students has been significant at about 10 per cent since 2008/09. According to the 2018/19 enrolment report, both campuses also exceeded their new-to-program intake target for international students, with UBC Vancouver enrolling 105 per cent of its target and UBC Okanagan enrolling 147 per cent. Now, the university is considering stopping the compound annual growth rate for new-to-UBC students — which was three per cent between 2014/15 and 2018/19 — for the next five years by maintaining a flat level of new international student intake. According to her, the Senate will consider the enrolment intake targets and five-year projections in its February meeting before they go to the Board of Governors for approval. “In its enrolment planning, UBC strives: to slightly surpass the government-funded number of domestic undergraduate students; to increase the enrolment of Aboriginal students; to ensure a strong national representation of domestic students; and to maintain a healthy enrolment of a diverse international student body,” Ratner wrote. A major consideration in the conversation around enrolment has been UBC’s space and resource capacity. 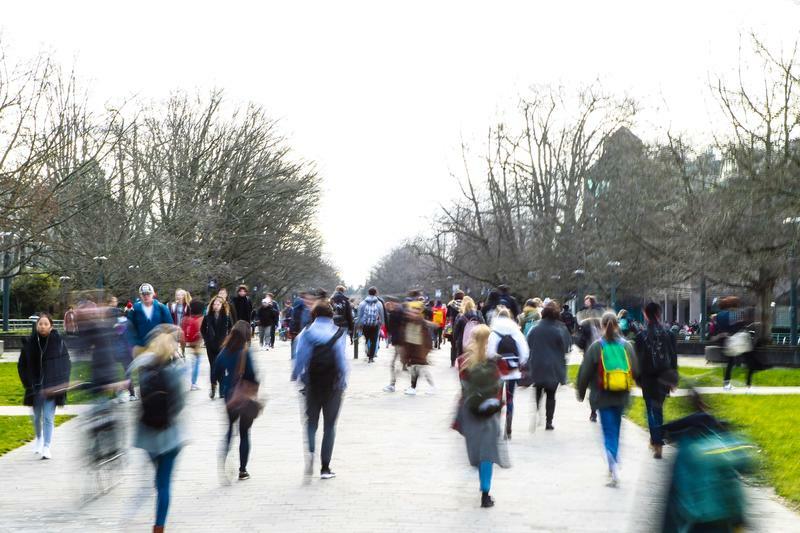 While the university reported that class sizes have not increased substantially over the past years, departments with high demand have struggled to manage the growth that has already occurred. UBC’s Undergraduate Chair of Mathematics Dr. Mark MacLean believes the increase makes it very difficult for instructors to give a personalized teaching experience. “I'm watching my colleagues just get exhausted, they're just feeling their classes are increasing, support is going down for teaching and that's discouraging when you want to deliver a certain experience to students and you aren't in the position to do it,” said MacLean. He argued that the inability to give personal feedback is one of the main consequences of the increase in students. AMS VP Academic University and Affairs Max Holmes thinks the challenge for UBC is to match the growth the university has had with enough resources. “We need to be making sure that we are putting the resources towards things like students’ services, making sure that we have enough counsellors, making sure that we have enough people to teach these large courses, and [overall] being prepared for something like that,” he said. Besides its plan to stabilize enrolment growth, UBC continues to build new housing and academic facilities for students. “In September 2018, the Board of Governors approved the Brock Commons Phase 2 project, which will provide 600 student residence units and academic facilities, including a new 150-seat general-use classroom, advising offices and other student service facilities,” wrote Ratner. But stakeholders believe the university must also go beyond reactive support. “From the AMS perspective, of course, we think that UBC could be more transparent to publish a long-term enrolment plan, to share that with the university so that people can understand, so that faculties can plan for this,” said Holmes.